A few years ago, I heard that eating black eyed peas and collard greens on New Year’s Day would bring good luck for the entire year. Despite not being terribly superstitious, and realizing that I had made it though many, many years without having eaten them, I had decided that we should embrace this new tradition. The first thing I had to do was figure out where to get black eyed peas. Next on the agenda was to find out what a collard was. The peas were easy. There was a large display stacked on the end cap at our local grocery store. I tossed a couple cans in the cart and headed over to the produce section. Of course, nobody there had the slightest idea what collard greens were. I decided they were similar to kudzu. A mysterious plant that runs amuck in the Southern states, yet is alien to the rest of us. I didn’t worry about them too much, we didn’t need them anyways. I wasn’t exactly sure what to do with those black eyed peas. The label on the can didn’t offer any serving suggestions, so I was on my own. I opened the can and peered inside to see what they looked like. Floating around in a murky liquid were little white beans with a large black spot on each of them. They reminded me of the navy beans my mom used to add a little sugar and vinegar to and feed to my brother and me. We loved them. My family thought they were weird. I had given up on the idea of our new tradition from lack of interest. Then last year, one of my Facebook friends, a true Southern belle, posted something about black eyed peas. My interest was renewed. I plied her with all sorts of questions and was rewarded with lots of information and recipes. I was ready to try this again. Only, it seemed as though everyone wanted to try it that year. 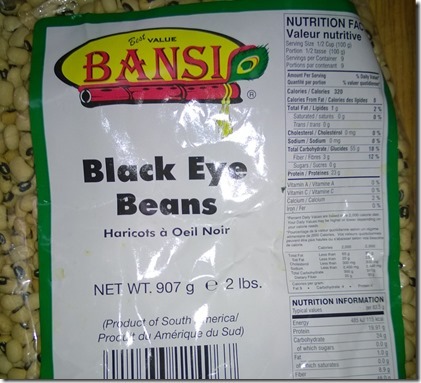 We went to five different grocery stores hunting for the black eyed peas. We looked in the canned section, the dried legume section and the frozen section (Apparently that’s how you can get them in the South) with no luck. I was ready to give up when Shaun found a dented can tucked in the back of the very bottom shelf in the last store we were in. After a long day of hunting for black eyed peas, I was in no mood to try cooking them. So I opened the can and fed everyone a plain, cold spoonful. Blech. I assumed our fledgling tradition of eating black eyed peas to start out the New Year was over. My family had other ideas. Yesterday, they all wanted to know when we were going to have the peas. I may have been nursing a slight hangover and merely growled at their teasing. As the girls left the house for the day, they wanted to know what time they should be back to have the black eyed peas. I realized that I wasn’t being teased. Much to my amusement, they had picked up that this was an important tradition to me and were willing to humor me. 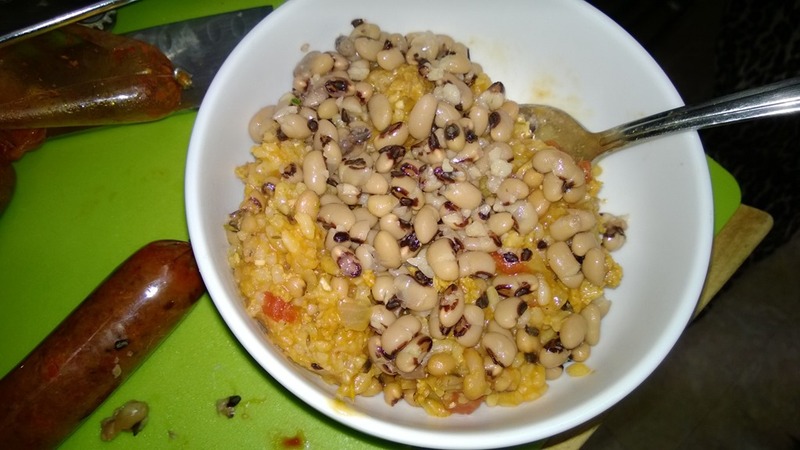 I found myself preparing a vegan recipe of Hopin’ John, a spicy Southern dish with rice and black eyed peas. It was much better than a spoonful of cold peas straight from the can, but certainly isn’t going on our list of favorite meals. Apparently, we have ourselves a New Year’s Day tradition after all. 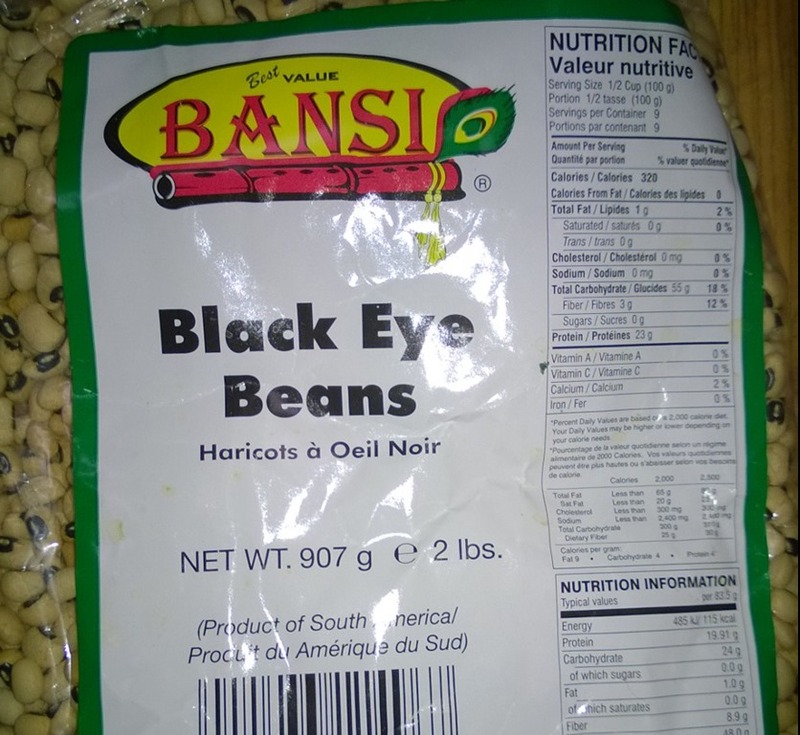 We eat black eyed peas in the worst possible way, just to get the bad stuff that every year has, out of the way as soon as possible. Happy New Year everyone! I hope 2014 is good to you. This entry was posted in Family, Traditions and tagged blackeyed peas, good luck, Hopin' John, New Year's Day. Bookmark the permalink. Happy New Year to you too! I have to admit that I can’t stomach black-eyed peas, even for the good luck.